We have known from the 2008 Presidential Campaign of Barack Obama that he supports the notion of redistribution of wealth. He said so on many occasions including the famous "Joe the Plumber" comment. What has not been very clear on was that he is already using the bankruptcy courts in America as a tool to accomplish this goal. As a candidate for President in 2008, Obama said, "Right now, bankruptcy laws are more focused on protecting banks than protecting pensions. And I don't think that is fair. Not the America I believe in." Obama set out almost immediately to remodel the bankruptcy court using the Delphi Pension Plan as a method of redistributing the retirement funds of a group of salaried, non-union retirees from Delphi to their fellow union retirees. This processes, facilitated in a extra-legal, process by Secretary of the Treasury Timothy Geithner, excluded the Pension Benefit Guarantee Corporation (PBGC) from meetings determining the fate of the Delphi pensioners. The PBGC is the only organization with the authority to strip pension benefits and they were deliberately excluded from these meetings according to hearings held by the House Oversight Committee (more on this in future interviews). 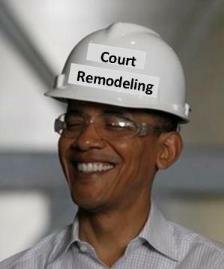 Has Equal Justice in our courts been remodeled by Obama as a tool to redistribute wealth? Barack Obama told us exactly what he was going to do. We did not listen in 2008. Now he has done exactly what he said he was going to do. He got "innovative" and restructured the government's bankruptcy courts to accomplish his political agenda of wealth redistribution.